The W.I.T.C.H. 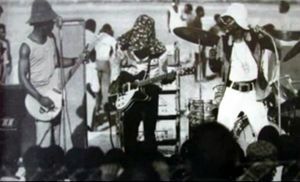 (or WITCH) (acronym for We Intend To Cause Havoc) were a Zambian music rock (Zamrock) band formed in the early 1970s. Widely seen as the most popular Zambian band of the time, Witch were formed during Zambia's golden post-independence days, and were headed by Emmanuel “Jagari” Chanda. With the economy collapsing in the late 1970s, and increasing government authoritarianism, Witch, like most Zamrock bands, were reduced to playing daytime shows to avoid the curfews, and faded away. The group originated from the famous Chamboli Mine Township in Kitwe. Renowned for notorious activities, Chamboli was one place where gangster life ruled and social life thrived with many teeny-bopper backyard bands in various sections. The band wore Afros, platform boots and cavernous bellbottoms, and delighted in defying conservative mores, sometimes taking to the stage with women's underwear over their jeans. Drinks and weed were always available. Keith Kabwe, who sang for Amanaz, another Copperbelt group, sums it up: "We smoked a lot!" 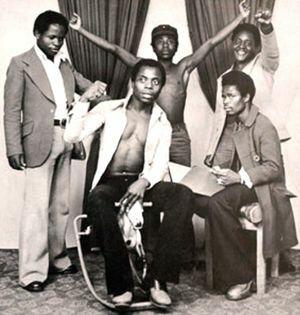 ”Introduction” and ”In The Past” (1972) are WITCH’s self-produced initial albums which happened to be released in tandem with the birth of the commercial Zambian recording industry. The garage rock-leaning tracks coupled with singer Emmanuel “Jagari” Chanda‘s English croons marked the beginning of the group’s five-year span as Zamrock’s driving force. Because there was no record printing company in Zambia at the time, the band printed their initial records in Kenya. With the coming in of the W.I.T.C.H and other bands such as Rikki Ililonga’s Mosi-o-Tunya Band, Zambians could now buy records that were made by Zambians for Zambians. The band later changed their manager as first misunderstood the insistence of signing a contract with the band as an indication of mistrust. As a result of this, the manager then took away his musical instruments leaving the band with nothing to work with. After discussions, the two parties reaching an agreement of 60:40 percent to share the master records. The band then decided to sell their 60% share to a new local recording company, Zambia Music Parlour run by Edward Godfrey Khuzwayo on the Copperbelt. The band made some of their songs in English, although most of its members did not have formal education and could not speak the language very well. This made them adopt words and accents from songs they heard other international musicians sung. As a result, some of the English lines in their songs are unclear. Their first two records — Introduction and In The Past — were exclusively in English. By the late 1970s, the glow had faded. Inflation and unemployment spiked as the price of copper fell. Music bootlegging was on the rise, and money to record and tour dried up. People preferred to spend on their livelihood rather than buy music records or attend concerts. Tastes were changing, too, as disco spread like a plague across the country. Jagari, who had been attending college since 1977, left the band in 1980 to become a full-time music teacher in Lusaka then a miner. He married his wife, Grace, in 1983 and struggled to ­support a growing family on a teacher's salary. Musical piracy hit Zamrock artists hard, and with no safeguards in place, bootleggers in neighbouring countries were able to make money by copying and selling the music of Zambian artists. Many Zamrock bands were disbanded and musicians thus left the profession to find other work to sustain themselves and their families. This page was last edited on 30 September 2016, at 05:13.